Hello, my name is Barb and I’m write-aholic! I’m married to Mr. Writing or so I like to say… Even though I try to write also in the real world, I give my best on secondary worlds or in the future. Or maybe in the past – but really past, not just last century! 1) How do you describe your writing style? 2) What has been the high point of your writing career? 3) What one thing to do with writing most makes you want to scream? 4) Where do you get your inspiration from? 5) What are you working on now? Kaylyn, the second book of vampires through the centuries that started last November with Rajveer the Vampire. She’s Rajveer’s sister-in-darkness and she’s an Anglo-Norman lady turned in the 12th century. 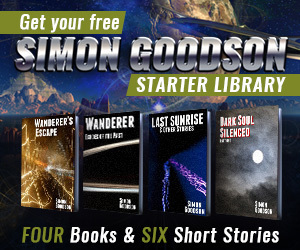 That story, Return of the Crusader, is included in the free anthology When the Lights go Out. The novel starts ten years later. And on May 2 a novella related to Rajveer’s story will come out. Charioteer of Buddha talks about two secondary characters of Rajveer the Vampire. 6) Of all the characters you’ve created, which is your favourite… and why? 7) The Seventh Question… What question do you wish people would ask you, and what is the answer you’d give? What does it feel like to write in a second language? Do you miss writing in your mother tongue? I’m fifty and I pride myself on having learned English on my own – no thanks to the Italian school system. I started preferring it to my mother tongue when I became proficient in understanding it (mostly through DVDs with English subtitles) at the beginning of the new millennium. At first, I translated my Italian works, with some rewriting and adjusting to the new language. I think the stories in English now, since that’s how they come to me… what can I say, I love English! And having English-speaking muses probably helps too! 😉 So I write in English first and then maybe I translate back into Italian… and my voice is changing, because I’m learning new stuff, both as vocabulary and craft. I’m reading a lot more fiction now than I used to, in English, to help my writing, and that really allowed me to become a better storyteller. Barbara G.Tarn had an intense life in the Middle Ages that stuck with her through the centuries. She prefers swords to guns, long gowns to mini-skirts, and even though she buried the warrior woman, she deplores the death of knights in shining chainmail. She likes to think her condo apartment is a medieval castle, unfortunately lacking a dungeon to throw noisy neighbors and naughty colleagues in.